Like many other people from Ottawa, I have been very much affected over many years by the courage of Jonathan Pitre, who passed away on Wednesday evening. He was 17 years old and suffered from epidermolysis bullosa. There have been tributes for Jonathan from so many, including hockey players and civic leaders and journalists, as well as Moms and Dads and all the rest of us. One of the most moving tributes came from the journalist, Andrew Duffy, who has followed Jonathan’s story over many years. Hard upon this story came the news of an accident in Saskatchewan that resulted in the death of 15 members of the Humboldt Broncos of the Saskatchewan Junior Hockey League. Most who died were under 20. When I read through the tributes to Jonathan Pitre and his mother, or those for the Humboldt Broncos and their families, I feel so grateful that I have never had to cope with such a difficult event in my life. I wanted to write about this, but I wanted not to focus on advice on how to manage such tragedies. I’ll give some references, in case some readers were hoping for advice. This is a great article from The Guardian considering one woman’s experience with the death of her child. I found that this article really helped me to contemplate how to be a comfort to someone facing this tragedy. I also found this article addressing what not to say to a parent whose child has died very helpful. The only guidance I would add to this list is: Be extra cautious about social media – it can catch people unawares, causing additional, unnecessary hurt. I learned all I ever need to know about what it would be like for a child to die from the two women in my life from whom I have loved the most: my mother and my daughter. My mother had two children who died very young. My oldest brother died of influenza in 1955 at age 2. This was 18 years before the World Health Organization first introduced flu vaccine recommendations for general use. A second brother died in 1956 of RhD hemolytic disease of the newborn. This is a condition that occurs when a mother who has an Rh negative blood type develops antibodies after being exposed to her child’s Rh positive blood during pregnancy. These antibodies may affect Rh positive children in subsequent pregnancies. The antibodies can cause severe illness, including death. In 1968, anti-RhD immune globulin (Rhogam) was introduced. By injecting inject mothers who were Rh negative with Rhogam, RhD hemolytic disease could be prevented. My brothers died too young to benefit from these medical discoveries. As a child, and even as an adult, I could never completely understand my mother’s ongoing sadness over my brothers. However, in the hour after my daughter’s birth, having held her for not more than twenty minutes, I understood what every new parent also quickly understands: I could not bear it if I lost this child. I ceased to wonder about my mother’s sadness. I no longer wonder at any parent’s sadness. I know I would be inconsolable if I lost any of my children and that is what Jonathan’s mother and the families of Humboldt are going through today. Are we not all with them in spirit? I also have one piece of advice that I can give. It is contained in this blog I wrote for The Scientific Parent. Sadly, it is one of the most popular blogs I have ever written. 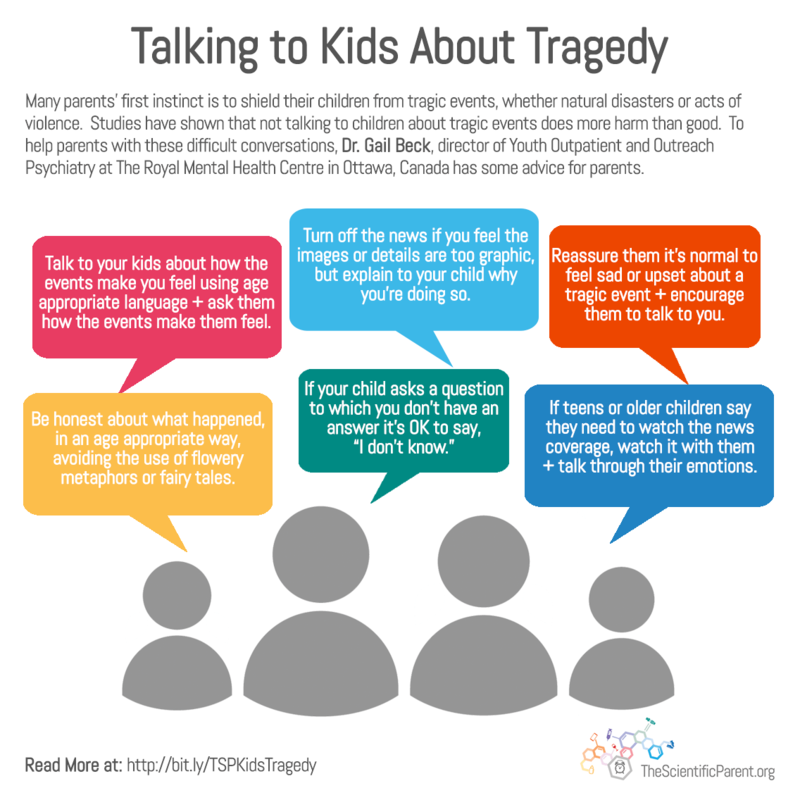 It provides advice on how to help children cope with difficult news. The Scientific Parent used the blog so much that they developed a graphic to go with it. I would like nothing more than for its circulation to end, but more realistically, I am glad if it is helpful.